You know what they say about opinions . . . but beyond just having one (or many), what do you do with yours? Opinions, or ideas, when communicated effectively have the power to influence thinking and inspire action. The question then is how to get your ideas across to other people. Communicating WIth a Purpose is about testing and deepening our opinions and ideas, and about how, when and why we communicate them. Together we are going to work on communicating ideas consciously and effectively. We will become better readers, speakers and writers. We’ll learn some history of communication. We’ll work on listening: to each other, to our audience, and to ourselves. And we’ll start this process by assessing what we have, and what we need and want from the program and from each other. We’ll begin the quarter by looking closely at written, visual and spoken examples in order to develop a collective understanding of what makes for effective communication. We won’t be using textbooks, but there will be some materials on reserve for photocopying, a few handouts, and some readings from the web. In addition to these readings, we’ll also listen to and study various speeches. We’ll briefly consider other forms of communication such as advertisements, photos, and movies. Much of this class will emerge from student interest and need. There will be an opportunity to work on projects, campaigns, or writing you’re already developing, but this isn’t required. 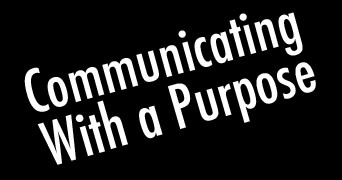 Communicating With a Purpose is primarily a place to consciously develop your skills and abilities as a communicator, and the program hopes to be a comfortable but serious space to improve how you get across to others what’s important to you. So, prior to the start of class, take some time to think about yourself as a communicator (listener, speaker, writer, etc. ), consider what will make this class useful for you, and be ready to talk about what you want to work on.